Square corners like most competitors. Copper kitchen sinks are a perfect way to add old world charm to your new world kitchen. Although typically used in country themed kitchen areas, the copper kitchen sink can be used in nearly any modern kitchen. They will stand the test of time and unlike stainless steel, copper can be re-patinated to suite any remodel down the road. 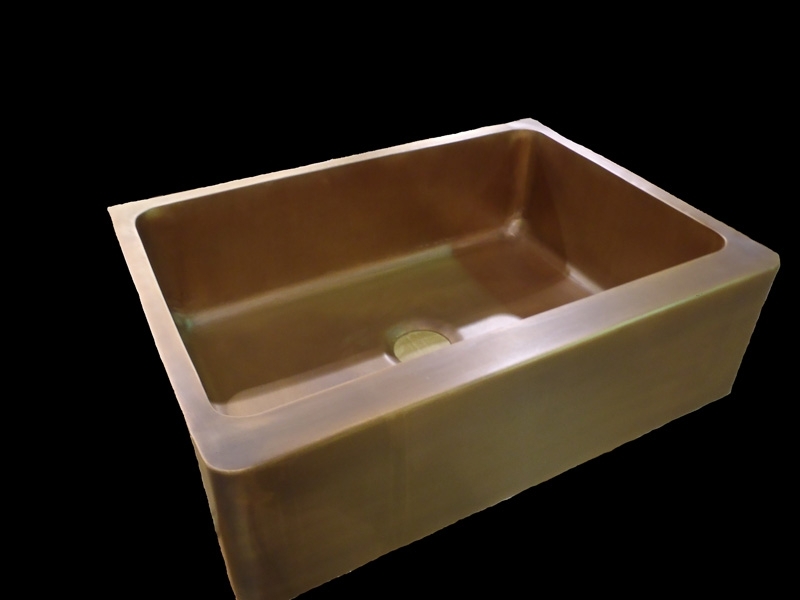 Signature Series Sinks: All Signature Series copper sinks, undermount or drop-in copper sinks are totally customizable to any size down to the 1/16”. They are made using 48 oz. (.0647 thick, 14 gauge), pure American copper. They all have 1.5” radius corners on the sides and bottom of the sink bowl. Undermounts will have a 1.5” rim around top and square corners to give more space to attach it with. Drop-in sinks will be made the same way, but the rim will have 1.5” radius corners to match the sink bowl, it will also have a ¼” bent down all the way around it for a caulk rim. Signature Series sinks in a farmhouse style will have an apron front that has the same radius corners as the bowl, but the apron will be taller and wider than the sink bowl to cover up the hole that will need to be cut out of your cabinets for the sink to slide in. Farmhouse sinks can be made in under mount or drop-in style. All sinks can have a living finish, be waxed included in price or have a clear coat applied for an extra charge. Circle City Copperworks handmade Signature Series copper kitchen sinks feature true craftsmanship, durability and enduring style. Copper is a beautiful and practical medium for your kitchen design. 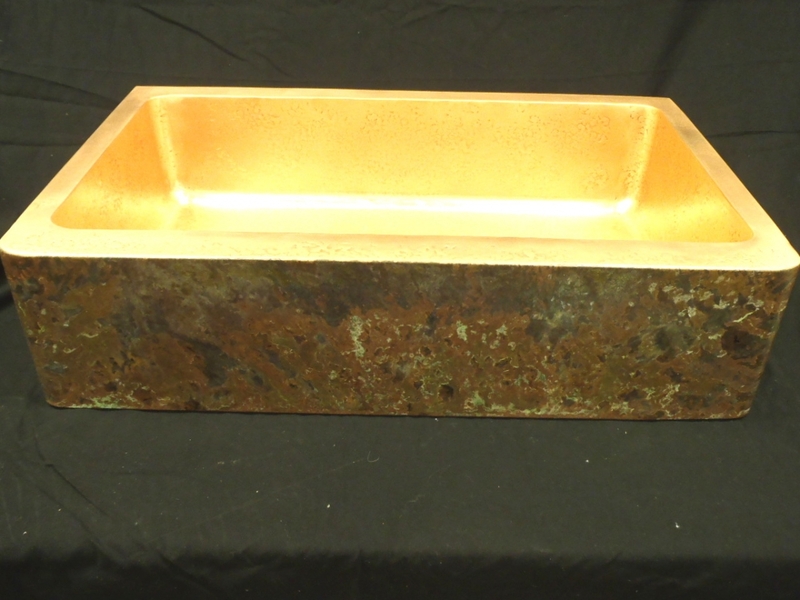 Our custom, to order copper sinks possess an eye catching look which is both stylish and unique. Please give us a call at 317-284-0687 for any custom ideas you may have, we will be happy to assist you. We cut out our radius corners and form them by hand to allow us to have a 1.5" radius on the vertical and horizontal corners. We are the only company that can give you a custom sized sink with radius corners on the side and bottom without it being a pressed sink. This is a 30”x16”x8” deep, smooth single bowl done in an undermount style with a Light Brown patina. You can see our disposal drain in this picture with an extra strainer to make sure nothing enters the disposal when it is not being filled up with water. It is made with pure 48 oz. American copper. We love when our customers send us beautiful pictures of our products installed. This is a hammered single bowl with a "living finish" on the inside of the sink. Our client wanted a custom "rainbow patina" on the apron, but still allow the inside of the bowl to naturally oxidize and patina over time. The size of this is 33"x18"x8" with a solid copper drain package included. 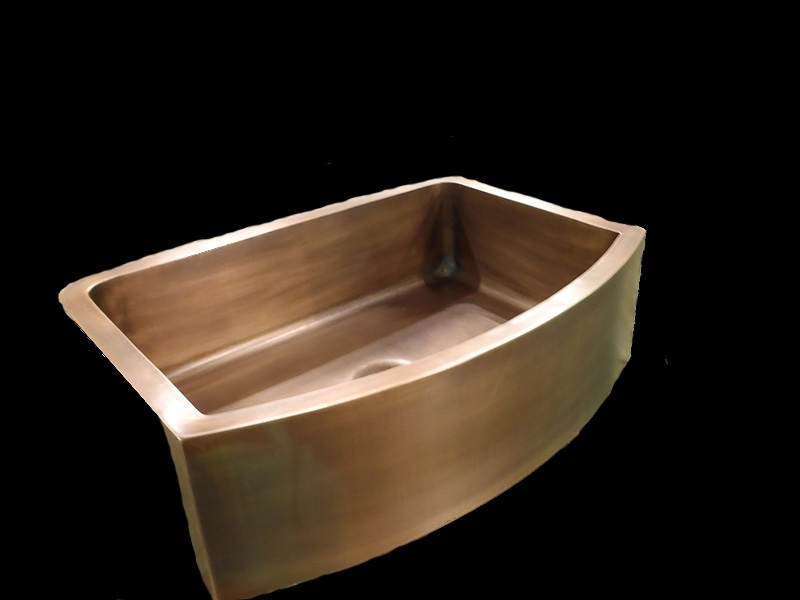 As with all Circle City Copperworks Signature Series copper sink, this sink comes with 1 1/2" radius rounded corners and bottom and is handmade using pure 48 oz. American copper. This is a Hammered single bowl with a bare finish, no patina. We leave the top rim smooth when it is an undermount and hidden under the countertop. This is to make it easier to install. The size of this sink is 33”x16 3/4”x10” deep. 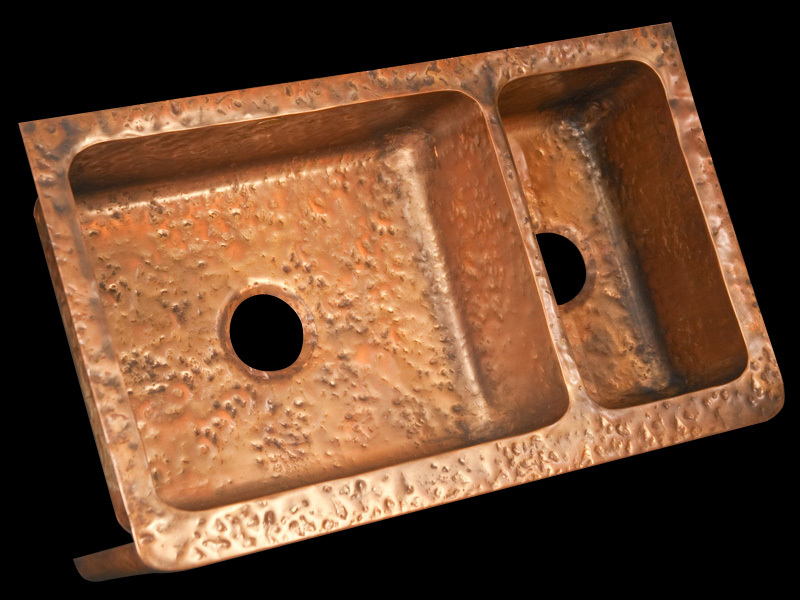 As with all Circle City Copperworks Signature Series copper sink, this sink comes with 1 1/2" radius rounded corners and bottom and is handmade using pure 48 oz. American copper. This is a picture of our Double Bowl Drop-in with Medieval Hammering. We done this in a Medium Brown patina and the size of each bowl is 15 ¼” x 16 ¾” x 10” deep. We can do this sink in Smooth finish as well; we will add a picture of one, as soon as we get one made that is up to our standards now. We did this one with the back flange being able to mount the faucet on it. This sink is 30" x 17" x 8" deep. Our Farmhouse sinks can stick out as far as you want it to; down to how thick the front edge is (from bowl to apron). We usually do this with a 2 ½” width to get the front edge out past the countertop. Pictured in a Medium Brown patina. Give us a call and we can walk you through the process of getting the sink you desire. 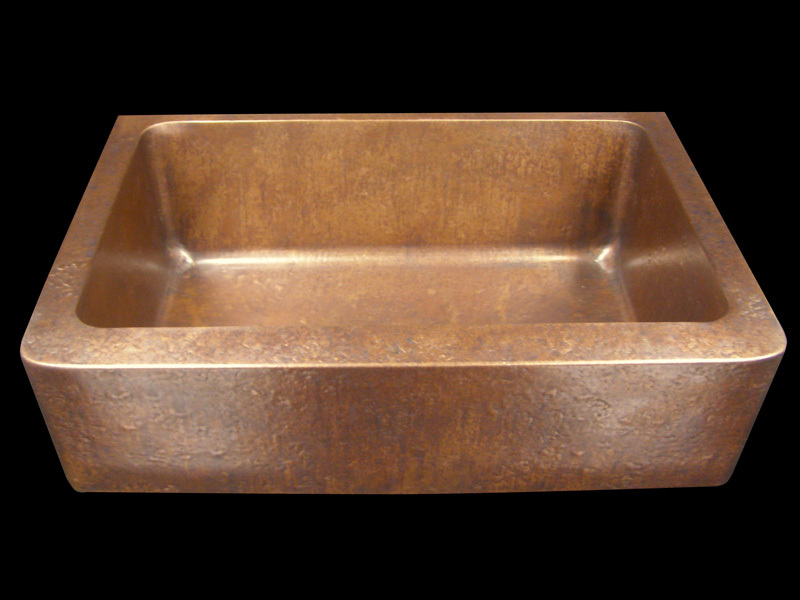 Pictures is a Hammered Single Bowl copper Farmhouse sink in a Mottled patina. The size is 31”x16”x7” deep, with the apron being 6 ½” tall. It is made from 48 oz. pure American copper with 1.5” radius corners and bottom. We made this in an undermount style, when we do a drop-in sink, we will round the back corners of the top rim also. Please call us at 317-284-0687 with any questions and pricing. The size of the bowls in this picture is 15”x15”x9” deep with the patina being a Medium Brown. It was made with the front of the apron ending up behind the edge of the counter. This client wanted the sink to protrude as little as possible. All Signature Series sinks made with pure 48 oz. American copper with 1.5” radius corners and bottom. Please give us a call or email, with any questions and pricing. Pictured is a Double Bowl Farmhouse sink without equal side bowls, to show we can make our products how you want them, outside of standard shapes and sizes. This is our Medieval Hammering with a Light Brown patina. This hammering is more forgiving of scratches than the regular Hammering. It was made with pure 48 oz. American copper, like all Signature Series sinks. Please call or email with any questions. The divider is what matters with these sinks. It does not come up to the top edge of the bowls. We can make the bowls any size, as with all Double Bowl sinks. The divider can come all the way down to the halfway point of the bowls or anywhere you want it, up to the top. We can make these in a Signature Series style or the Traditional Series style. Give us a call or email with any questions and pricing. This is a 15" x 17" double bowl sink in our regular hammer with a varied dark patina.This custom sink was made to replace a stainless steel sink that wasn't fitting into the customers remodel plans. They sent us a template of the hole already cut in their granite, so it could be made to fit perfectly. This was a good way to save the customer the effort and cost of cutting a new hole in their granite countertop. This customer wanted a little of both worlds with the farmhouse style with a 3" radius added to the front of it. On the bottom only, the two sides and the back are rounded in the Signature style. The front apron at the bottom is a 90 degree corner. This sink is in the Light patina finish. 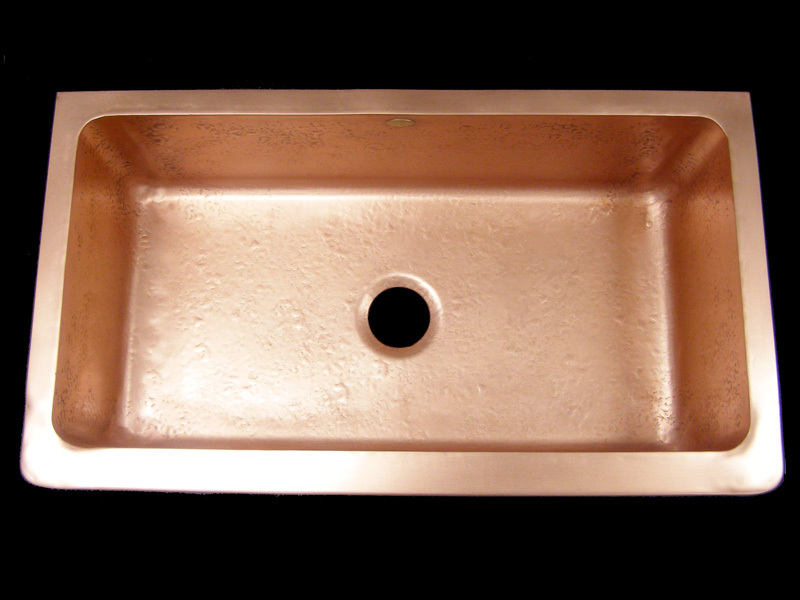 We will happily work with you to make sure you get what you desire in your copper kitchen sink. 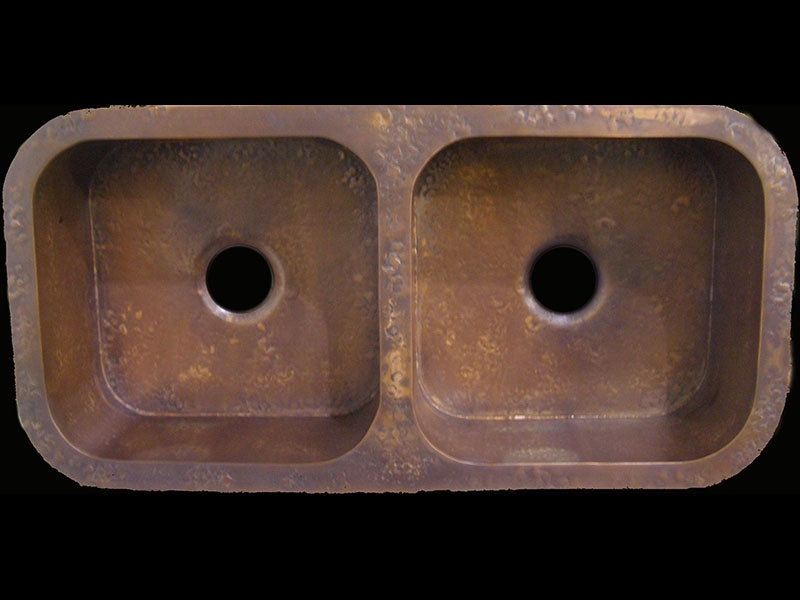 Our drains are solid American copper and manufactured by us. We can color these to match whatever patina you choose for your sink. The one on the left is the disposal drain and will Fit Insinkerator® type units with 3 3/8" ID as well as most Kenmore® , KitchenAid®, Maytag® , Jenn Aire® , and select models of Whirlpool® . Will not fit Franke® Waste King, or Whirlaway® models. The right drain is our strainer drain, it comes with a PVC bottom for easy installation, these two can be used for prep sinks also. The smaller one in the front and middle is our smaller prep or bathroom sink drain for a 2" opening. All drains are $150 with the purchase of a sink only. 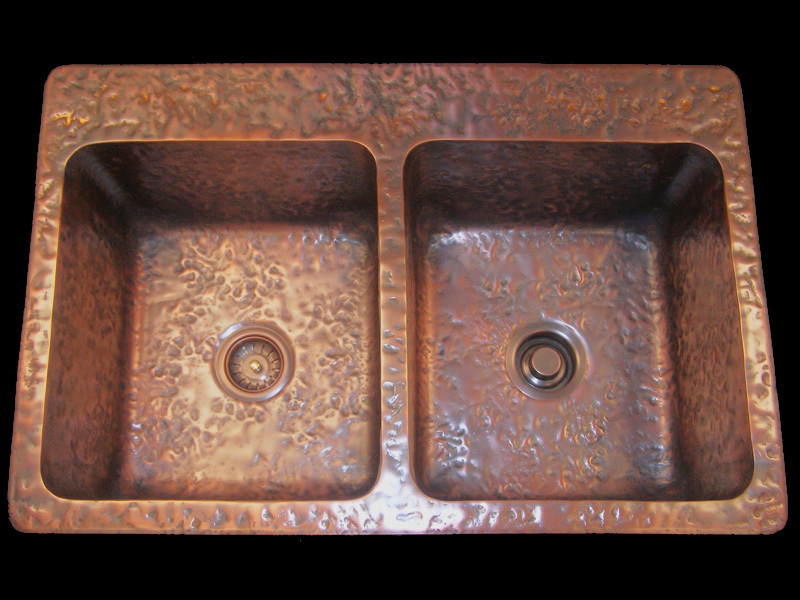 Circle City Copperworks will add a classic look to your kitchen after installing our custom made copper signature kitchen sink. 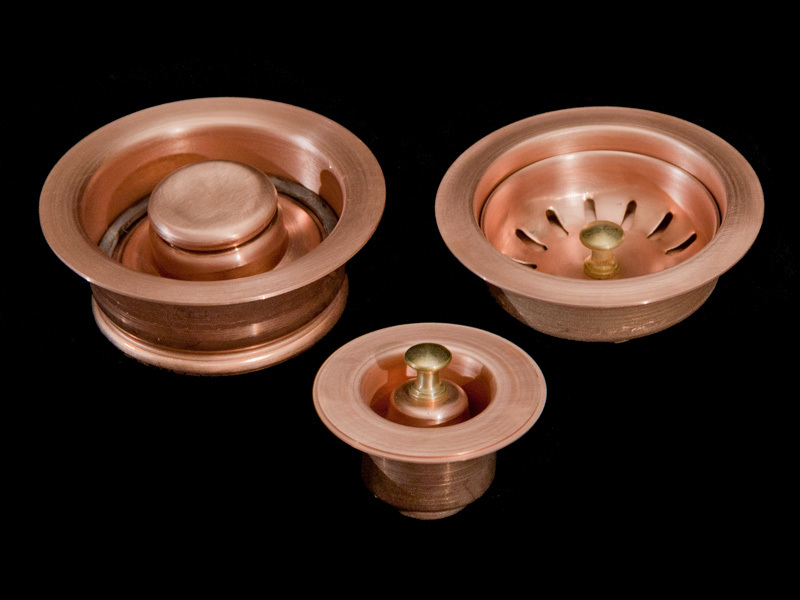 Above, you can see from our portfolio, the different types of copper kitchen signature sinks, each seen are custom made by the finest standards. 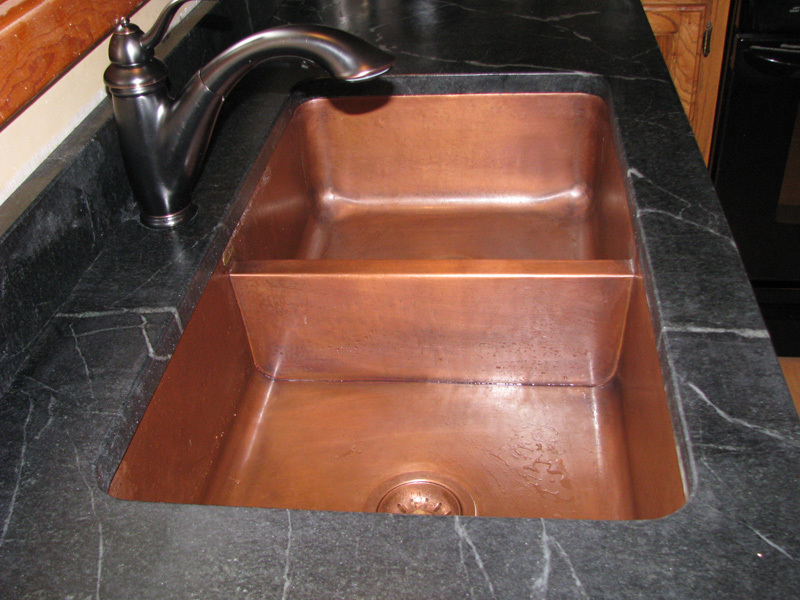 More home owners realize that copper kitchen signature sinks are both beautiful and functional in any kitchen. New home owners install copper kitchen sinks to accentuate their kitchen's beauty, to add character to a room by installing a copper item. 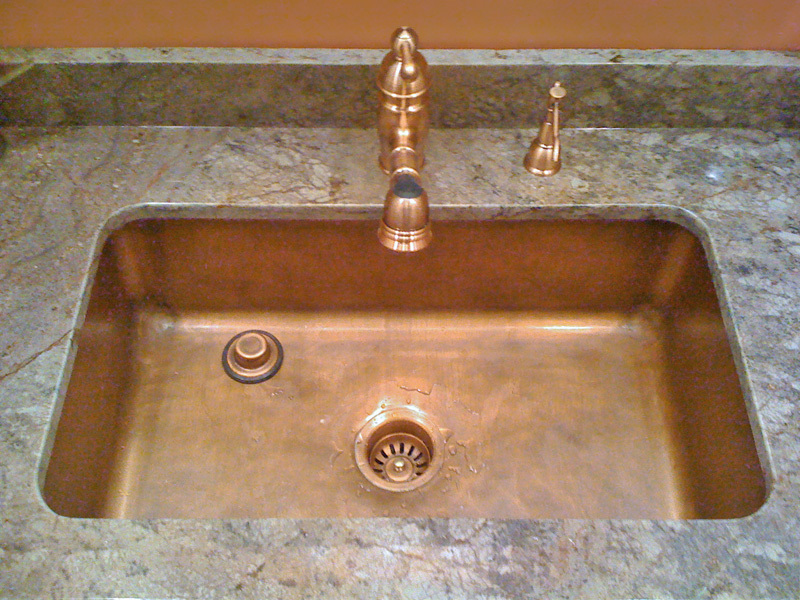 Copper kitchen sinks add class to any gourmet kitchen when you select from our custom and pre-designed copper sink. 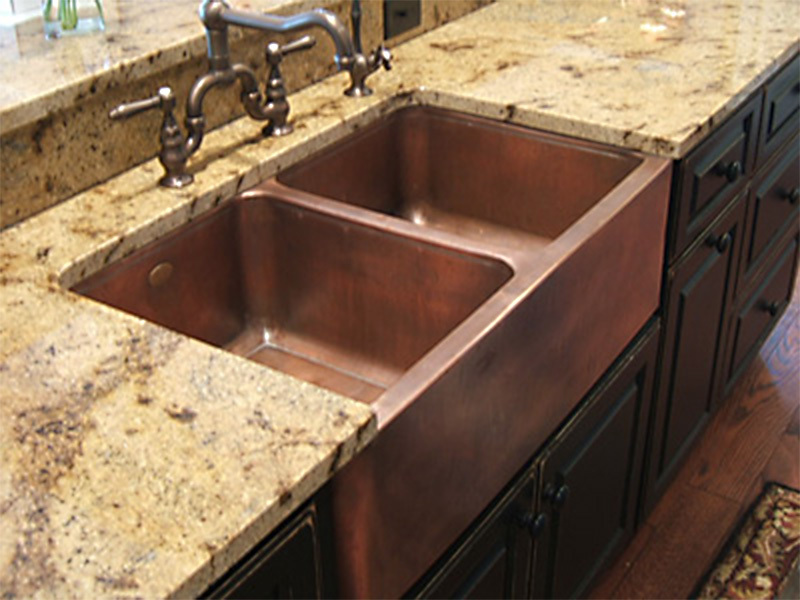 Choose today to remodel your kitchen with one of our copper kitchen sinks!